Wednesday April 3, 2019-A Wiper MP has asked ODM leader Raila Odinga to desist from politicizing Deputy President William Ruto's donations to churches all the time. Speaking yesterday, Borabu MP Ben Momanyi said Dr. Ruto's philanthropic activities should be appreciated instead of persistent castigation from the ODM leaders across the country. He noted that it was unfortunate to see Ruto castigated in everything he does including participation in fundraisers. "I think Rt. Hon Raila Odinga should not castigate DP William Ruto all the time. He should appreciate him even once in a while. Accusing someone of theft just because of fundraisers is not good," he argued. "If you're in a position to help a church, just do it. It's not important to always attack him. 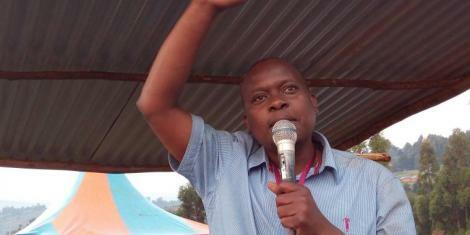 It's time we embrace peace and stop political witch-hunt," said Momanyi. Over the weekend, Dr Ruto visited Gusii region and donated Sh10 million towards construction of South Kenya Conference offices at Nyanchwa in Kisii County; something that has raised eyebrows.